When you think of precast. Think of Pro-Cast. 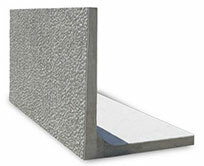 The L-Wall is Pro-Cast Products’ instant retaining wall. L-Wall is designed in a number of wall heights with its own footing and decorative face. We have several designs that allow for a level backfill or a 2:1 surcharge. The L-Wall serves as a complete retaining wall. We make models with shorter footings behind the wall with rebar extended from the bottom front so you can finish off with your own (poured-in-place) foundational footing. You simply backfill the wall and you are finished.